Students are returning to the area. The seasons first football games have been played already at the local universities of EMU and UofM. Road traffic will triple. The place will be busting at the seams with activity. I love the Ann Arbor / Ypsilanti area. We are booming with the arts. There are so many artists, musicians, writers and performers around here that it makes your head spin. There is always some art event to attend. At the Riverside Art Center, where I docent, we are preparing for two September art exhibits: It Grows on Trees -II and Trumpets for Democracy:Blood for Oil. We’ll also have a September theatre production called The Foreigner. For you local artists, we’ll be holding our annual Holiday Art Show in November. It’s like a weekend art fair and you can download the prospectus at the website. http://www.riversidearts.org/. 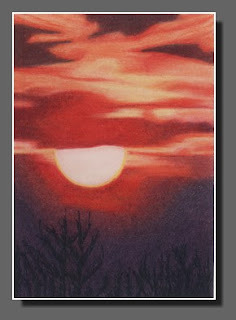 My personal art happenings: You can see some of my miniatures at the Daisy Lake Art Gallery in Dexter, MI. I’ll have work in two September exhibits, one is a theme show called Elements at the Power Center in Ann Arbor with the Chelsea Painters. The other one is Midwest Color 2008 in Dearborn, MI at the Ford Community and Performing Arts Center. I slowed down a bit the last couple months with my art. Tis the season to get back to pushing the pencils…. Thanks to all of you!! And thanks for stopping by.